For the past two years, my son has been obsessed with Toy Story. He has watched all three of the movies more times than I can count, he has several of the toys and he even wears Toy Story clothing and pajamas! Last month something strange happened…it started reaching for the Monsters, Inc. and Monsters University DVDs. Could it be that he has a new favorite? I think so! He still loves Toy Story but I think we have a new favorite. His birthday is coming up in May and I always start planning way too early. For this party, we’re either going to do a Monsters, Inc. or Mickey Mouse theme so I’ve started gathering adorable ideas. In this post, I’m going to share some of my favorite Monsters University party ideas with you – they are all so cute! I also can’t believe the amount of free printables out there for this theme. Planning this party would be so fun! Leah & her team at Iced…Bake Shoppe are fabulous to work with and their cookies are always perfect. 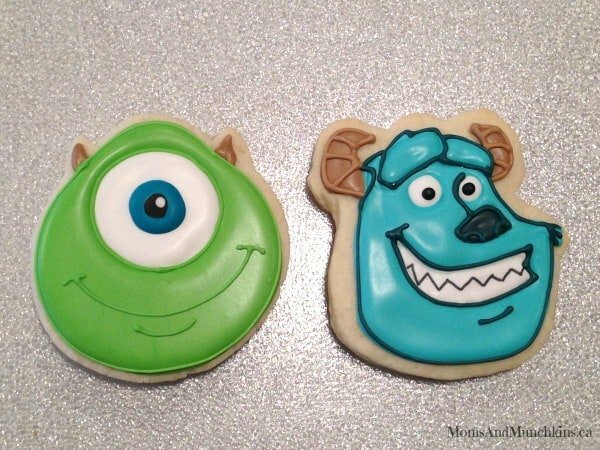 Check out these adorable Monsters, Inc. cookies. Brittany of Edible Details is a genius with fondant – check out these Monsters University inspired fondant letters. 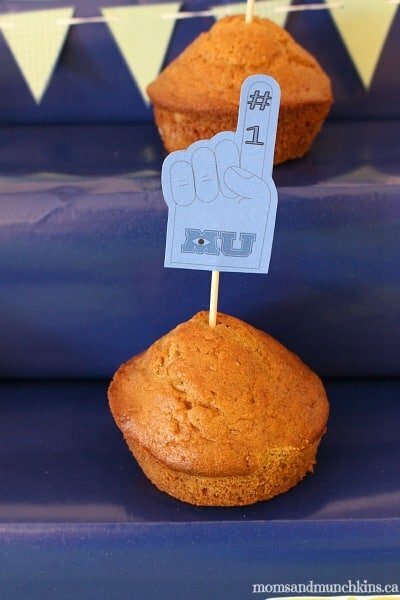 To make these foam finger cupcake toppers, simply copy a smaller version of this foam finger printable from One Charming Party with some Monsters University logo stickers. These Monsters, Inc. hats by Michelle’s Party Plan-It are so adorable! 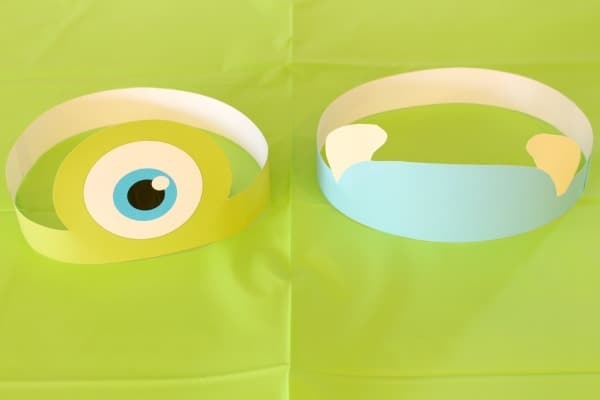 Simply print and cut them out to fit each of the little “monster’s” heads. 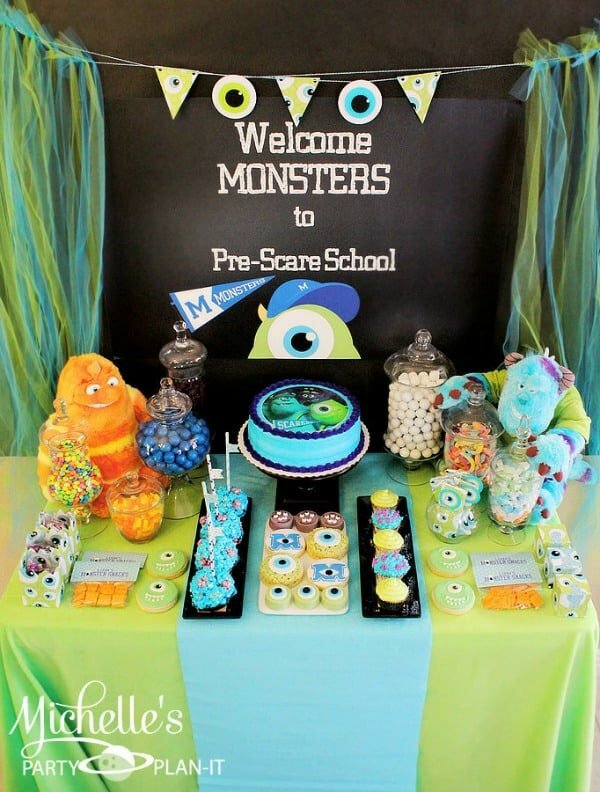 One of my absolute favorite party designers, Michelle of Michelle’s Party Plan-It, put together this Back To School bash with a Monsters University theme for her sons. There are so many adorable touches in this party plus she shares tutorials on how she made several of the items. This party is a great source of inspiration! 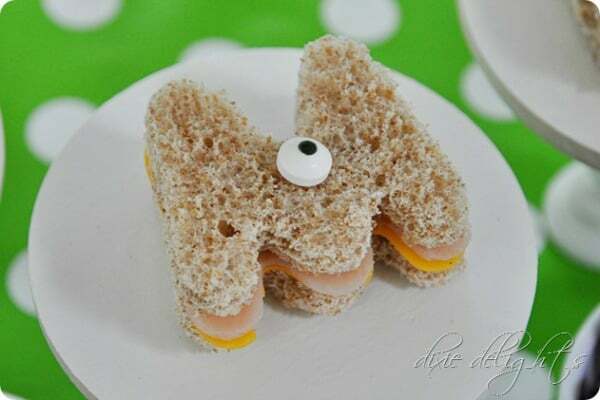 There are so many fun ideas in this post by Dixie Delights but one part that really stood out to me as unique are these fun Monsters University sandwiches. Super clever, right?! 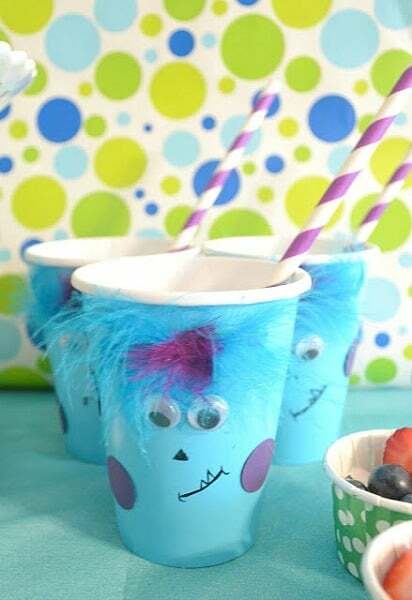 I love homemade decorations and it doesn’t get much cuter than these Sulley cups by Project: Party Perfect! Your kids could even help to make these for the party. 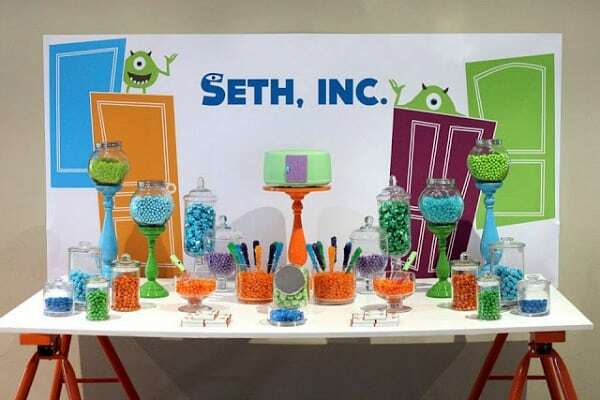 I love the door backdrop for this Monsters, Inc. party featured on The Little Big Company. There are a lot of clever details in this party like the homemade canisters and Boo’s door. 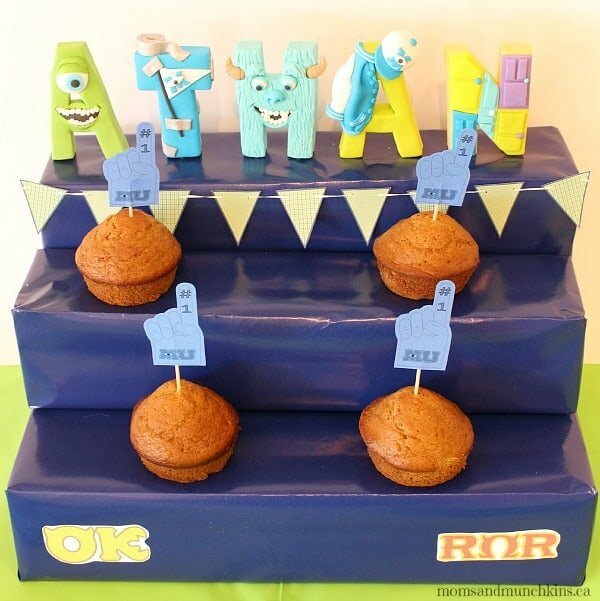 This cute Monsters University dessert table by Laura’s Little Party is cute! I love all the green & blue plus she shares free party printables! Monsters University Party Ideas – Freebies! 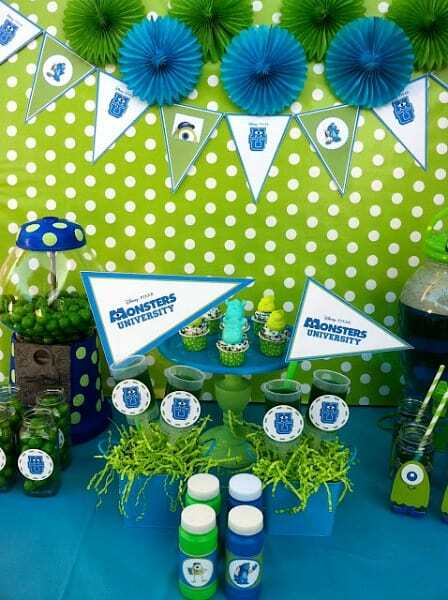 Here are some additional fabulous Monsters University party ideas with freebies! For more fun party ideas, visit our Birthday Party page. We’re always adding new ideas! Never miss an update by following along on Facebook, Twitter, Pinterest and Bloglovin’.